Ah, Fort Wayne. When we’re not at our home base in western New York, we’re more likely to be in northeastern Indiana than anywhere else on earth. 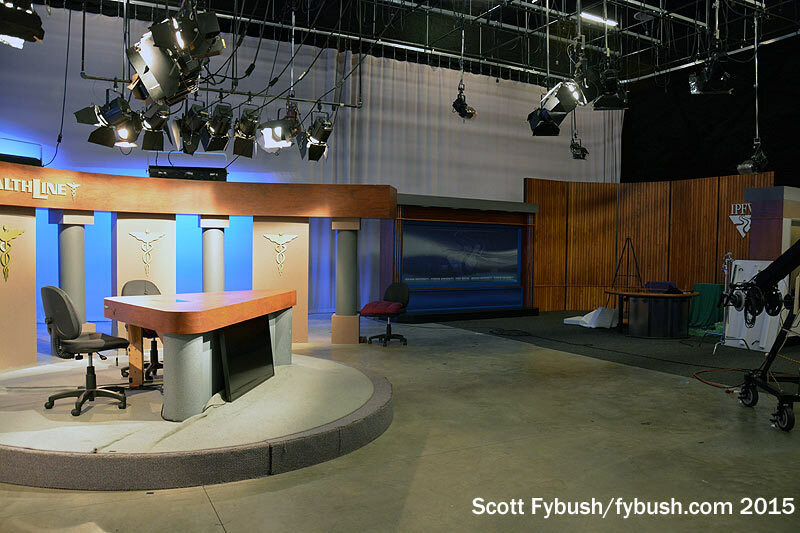 That’s because of the in-laws, of course – and as much as we love them and enjoy spending time with them, it’s also been fascinating to watch as the broadcast market around them has evolved in the 25 years we’ve been visiting. We spent an awful lot of the summer of 2015 in Fort Wayne, as it happens, in part because we thought it would be a fun idea to host a convention of North America’s DX clubs in our adopted second hometown. 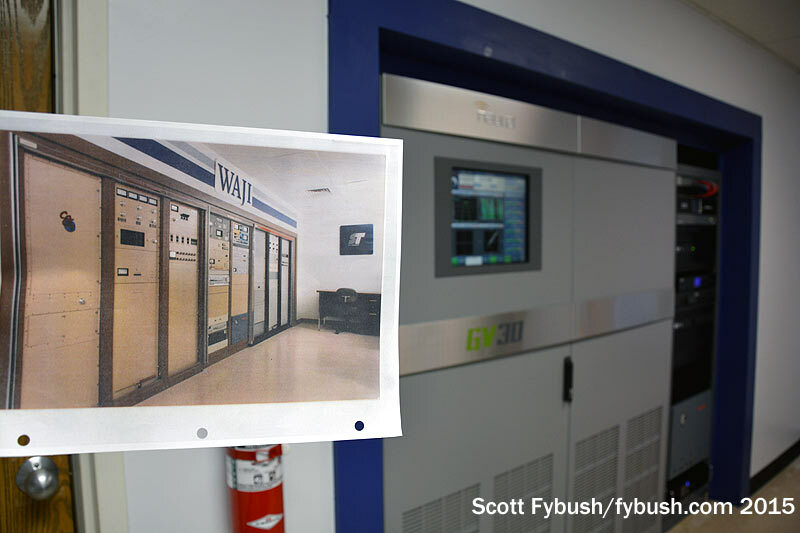 It was fun, in fact – and it gave us the chance to catch up with many of the engineers in Fort Wayne, give the DXers some nice tours, and get ourselves in to see what’s been doing at some sites that we’ve shown you here in the past. 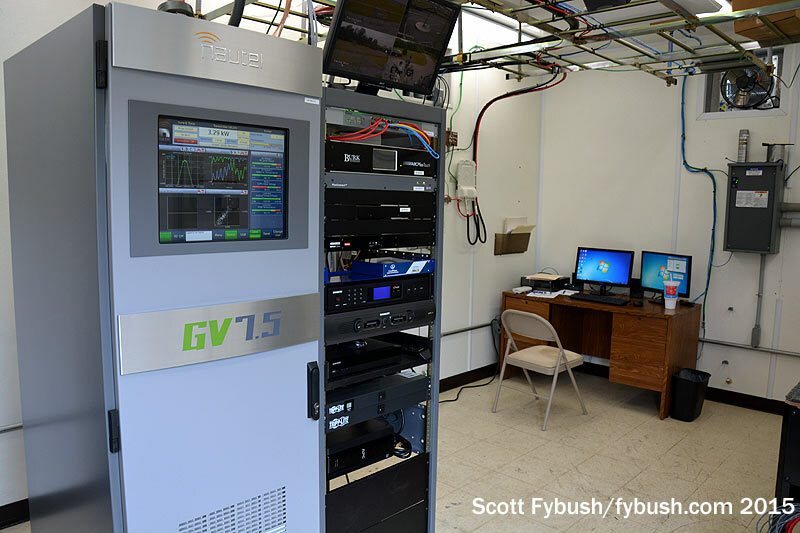 As we showed you a year or so ago, WLDE had relocated its transmitter to a new tower on the east side of town, a mile or so east of its previous location. 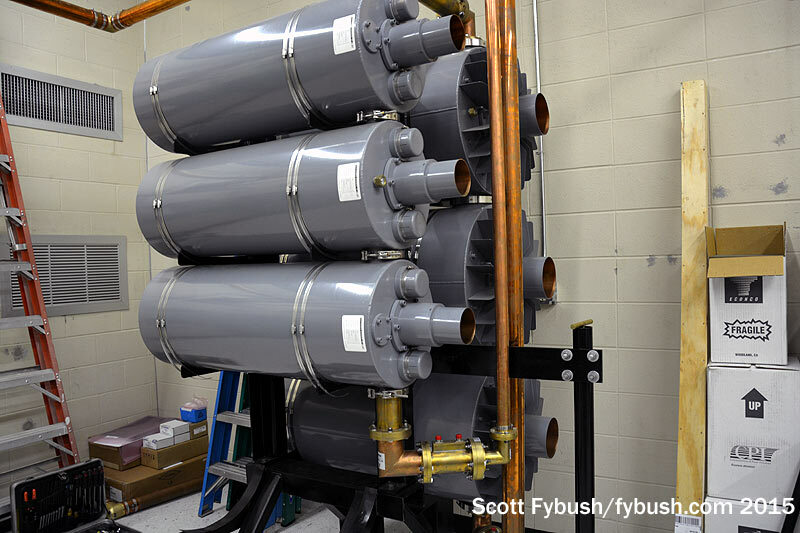 This time we got to go inside the new site, where a tidy Nautel installation sits in a prefab building atop a former landfill. 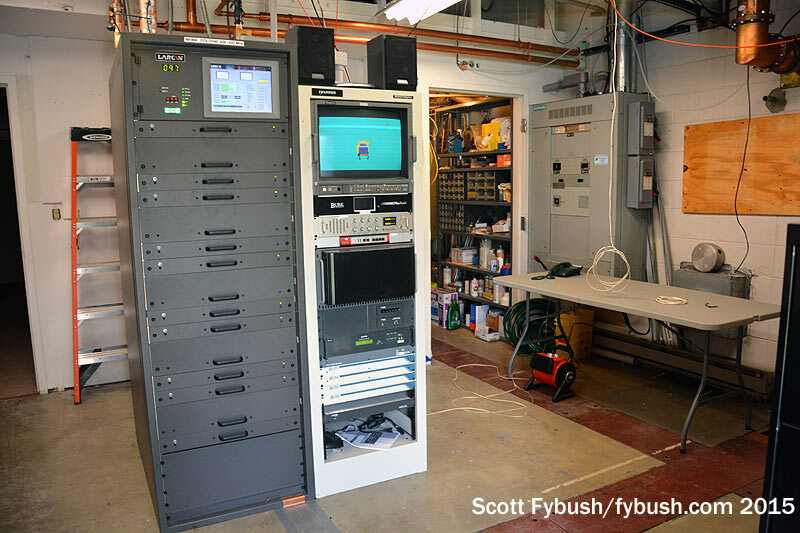 In an adjacent room, the huge old WFWA analog transmitter was long gone, replaced by a much more compact digital transmitter operating on RF 40. 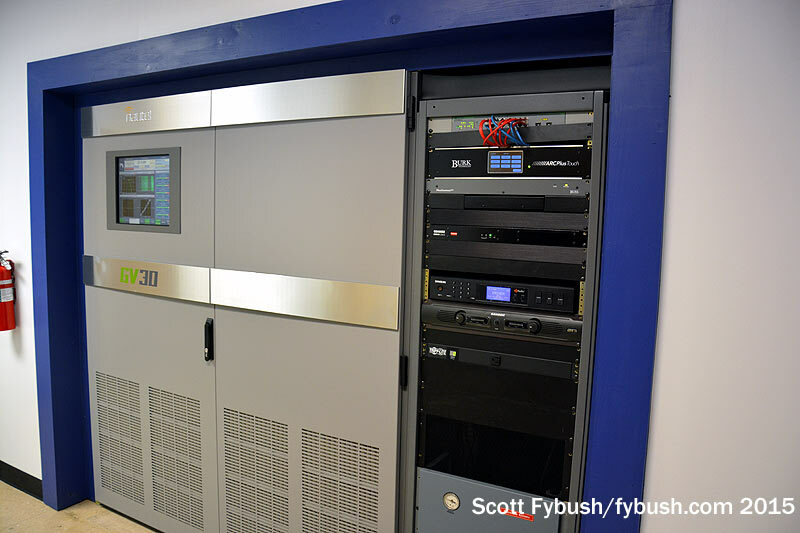 The rest of the building, originally WFWA’s studios, is now being used as studio space for WINM (Channel 63), TCT’s local Christian station, which also operates low-power W38EA-D from here. Across Hillegas Road, we finally got the chance to peek inside one of the other sites at the main Fort Wayne tower farm that had long eluded us. 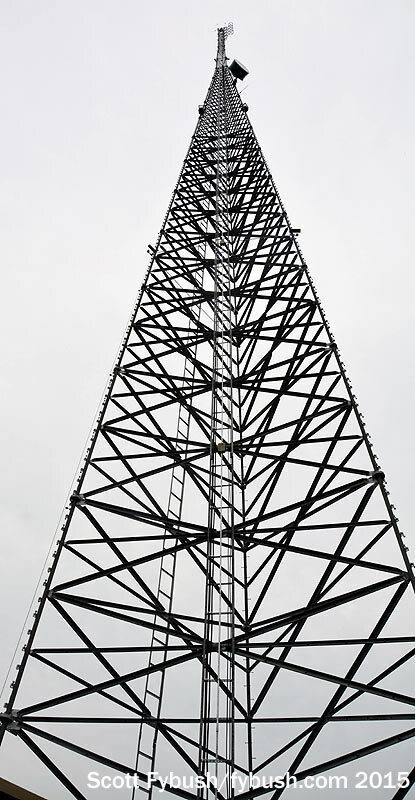 WMEE (97.3) is Fort Wayne’s oldest FM station, and its tower has been the northernmost big stick in the tower farm since the 1980s, when it broke away from former sister station WKJG-TV (Channel 33). 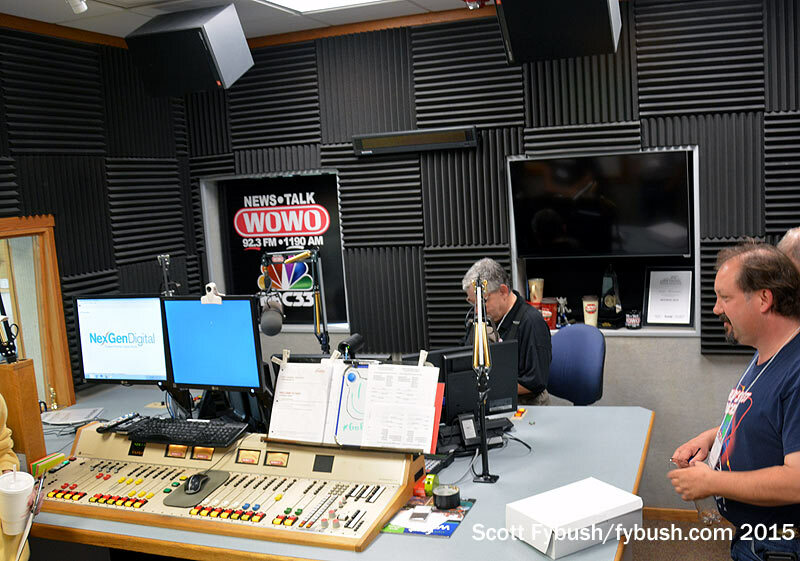 Today, that 720-foot tower is home to three Federated Media stations: WMEE, country WQHK (105.1 Huntertown) and what was news-talk WOWO-FM (92.3) when we visited. 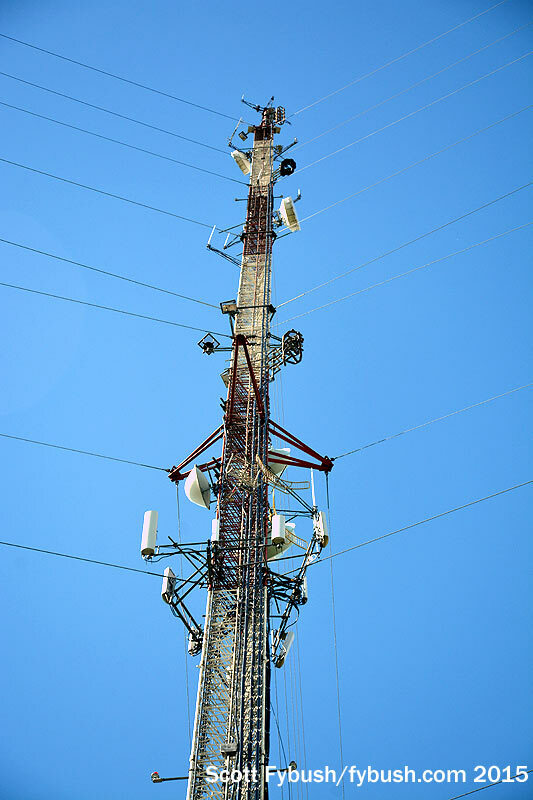 WMEE and WQHK share a combined antenna at the top of the tower, with 92.3 and an aux for WMEE-WQHK down below among a forest of cellular and other antennas. 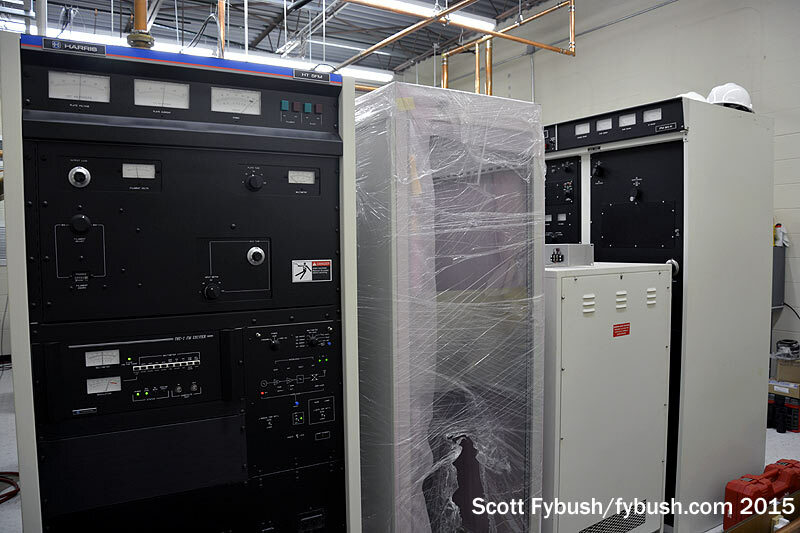 Inside, the transmitters line up in neat rows: 92.3 (and some incoming new gear and outgoing old gear), then 105.1 and 97.3 across from their combiner. 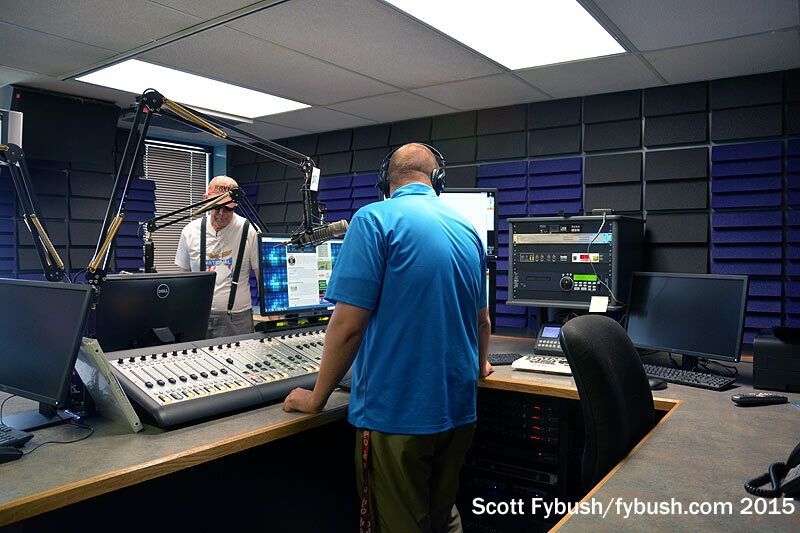 This site added two translators in December: 107.5 is now WOWO’s FM relay, 100.9 relays sports WKJG (1380) – and 92.3 just became classic hits “Big 92.3” with its old WFWI calls. More tours for the DXers? 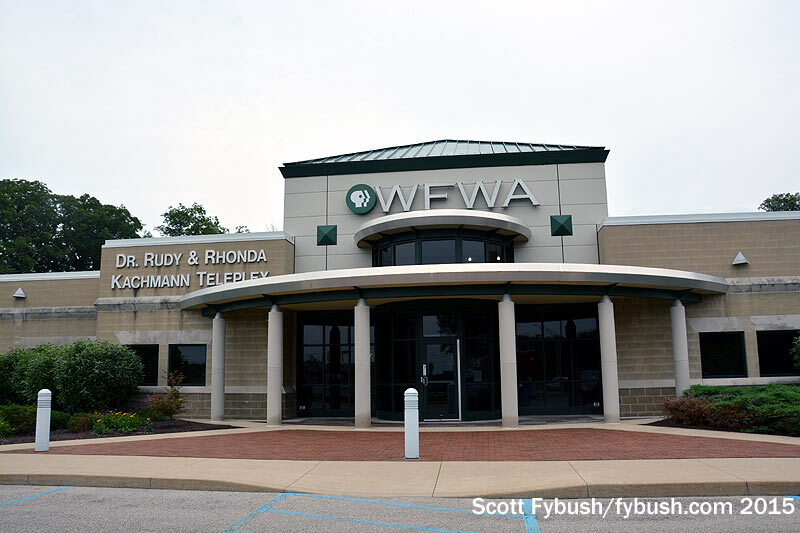 You bet: on the northeast side of town, WFWA moved from its Butler Road tower site to a new building across from the Indiana-Purdue Fort Wayne (IPFW) campus a decade or so ago. 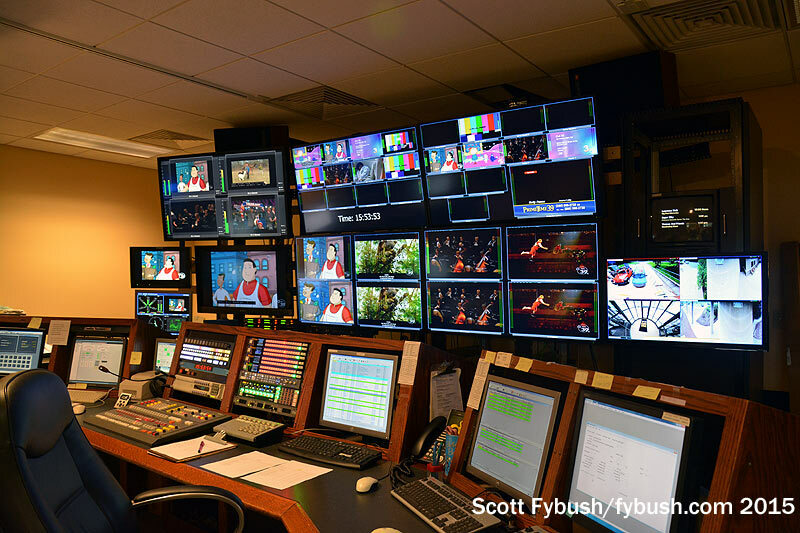 WFWA’s broadcast center was going through some upgrades when we visited: its master control can finally pass full HD, and the production control room behind it has also recently been upgraded for local HD and digital audio. The studio at the very rear of the building is still one of the biggest in town; that’s just half of it you see below. 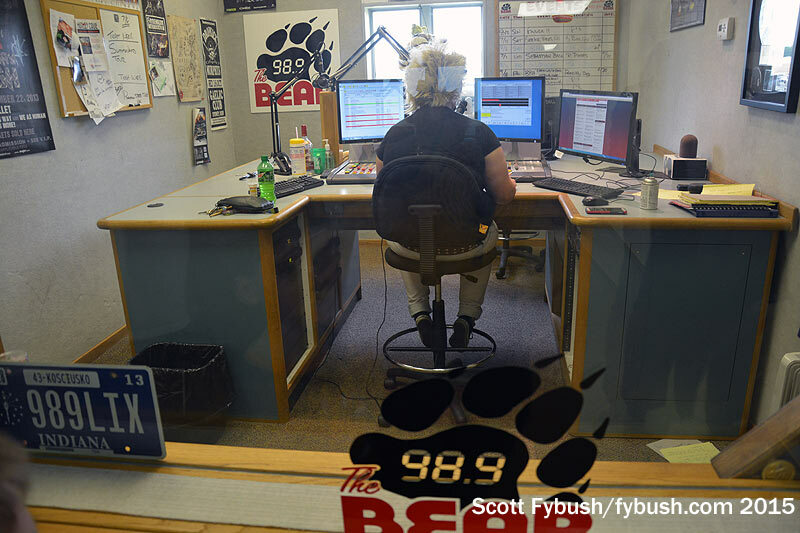 Early last year, we spent an entire Site of the Week article showing you the former Summit City Radio Group studios on the south side of town, newly renovated to house a much larger Adams Radio Group cluster. 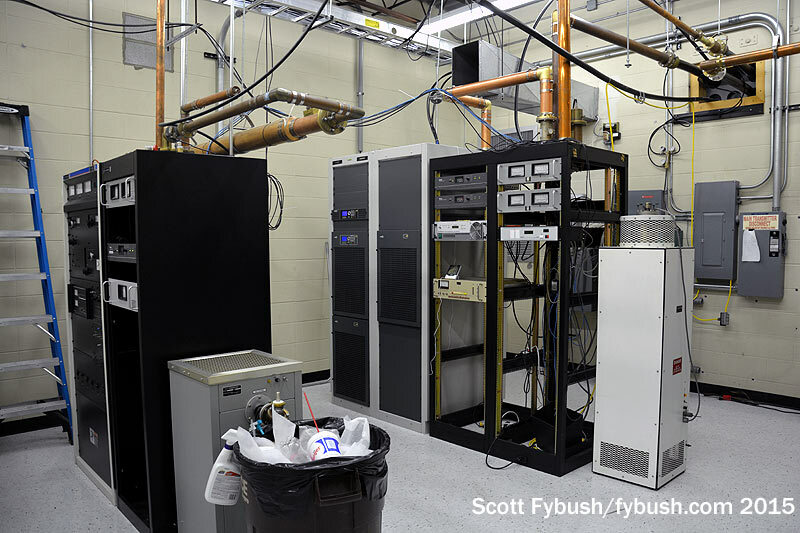 We took the DXers on a nice tour of the facility, and while we won’t repeat the entire tour here, we’re happy to share the niftiest image of that Saturday afternoon. 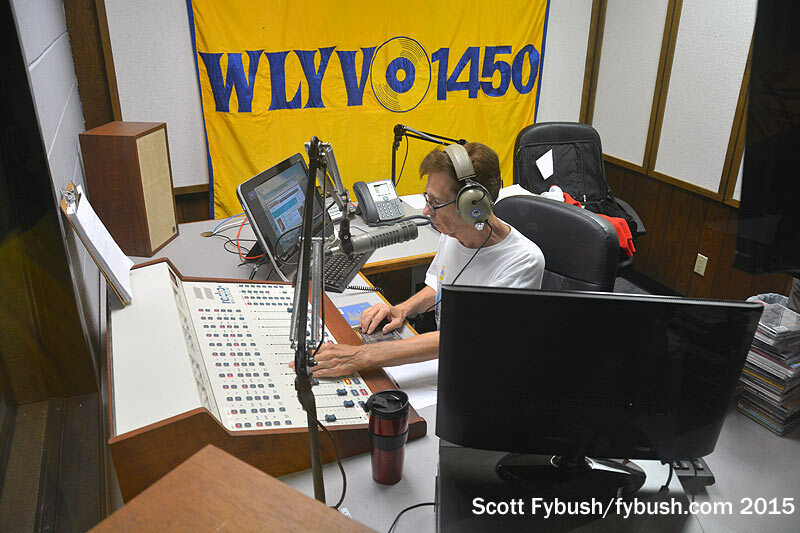 That’s veteran Fort Wayne jock Rick Hughes doing a weekend oldies shift on WLYV (1450), the station Adams runs as a talker the rest of the week. It’s fun to see and hear it return to its top-40 roots for at least a few hours, and Rick was having a grand old time doing it. 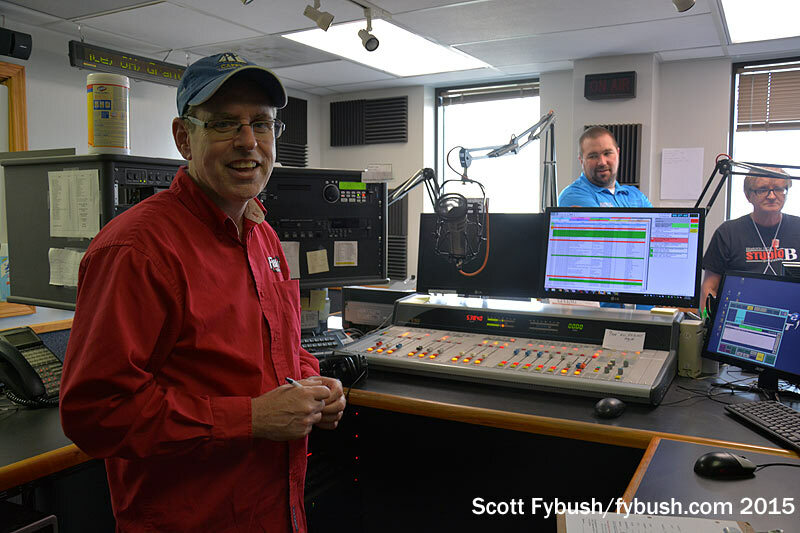 After our visit, Adams made a few shifts, too: WLYV is now simulcast on the 103.3 translator that Adams had been feeding with an HD subchannel carrying classic country, and rocker WXKE (96.3) is now carrying the syndicated Bob & Tom morning show, long heard on Federated Media’s WBYR (98.9). 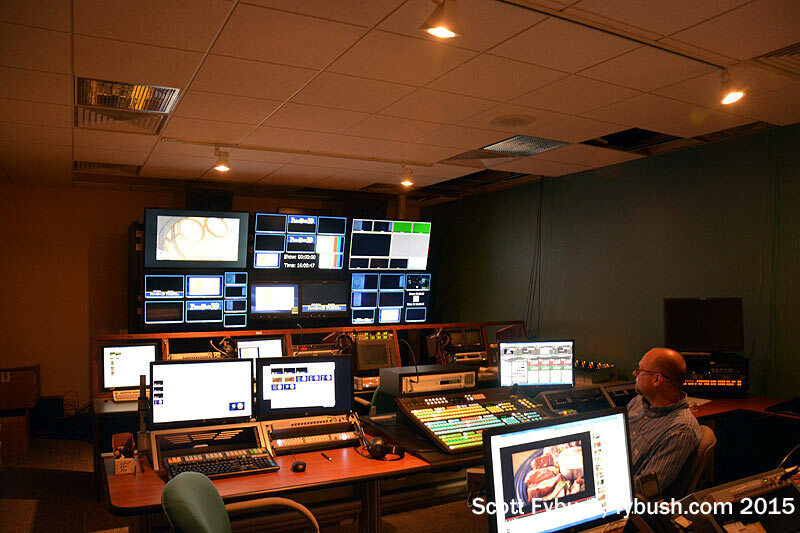 Thanks to Dan Kennedy (ex-WAJI), Sarkes Tarzian’s Jamie Till, WFWA’s Bruce Haines, Adams’ Ed Dider and Rob Mackenzie and Federated Media’s Jack Didier and Mogan David for the tours!